When World War 1 erupted in 1914, the status of women in Canada was very different from what it is today. In 1914, women were not allowed to vote nor were they allowed to serve in a combat role in the Armed Forces. At home, women took over the jobs left vacant by the men who went off to war. This poster pictures women in the fields while seemingly asking them to donate money though war bonds. 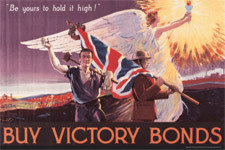 Many propaganda posters in wartime exploited the belief “God is on our side” and turned the nation’s participation in the war into a holy crusade. The feeling that one was not only fighting for King and country, but also doing God’s will. The Union Jack is featured prominently that underlines Canada’s strong ties to Great Britain. 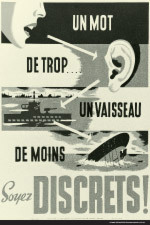 This poster was created to entice young French Canadian men to sign up for the army by appealing to their “manhood” and sense of adventure. 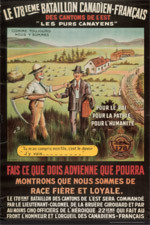 In 1915, Quebec was primarily an agrarian society. Far work was constant and labour intensive. Between 3,500 and 4,000 Native Canadians or approximately 35% of eligible Native Canadian males served during the First World War. These men enlisted voluntarily as Native Canadians were exempt from conscription. 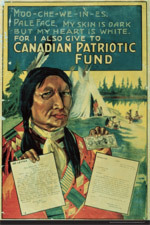 This controversial poster encourages non-Native Canadians to increase their participation in the war effort. One of the purposes of wartime propaganda is to demonize the enemy in the eyes of your countrymen and countrywomen. Propaganda of this sort is designed to evoke a very strong negative reaction to the enemy. One of the ways of accomplishing this is to depict your enemy committing atrocities. This point is gruesomely illustrated in this poster. 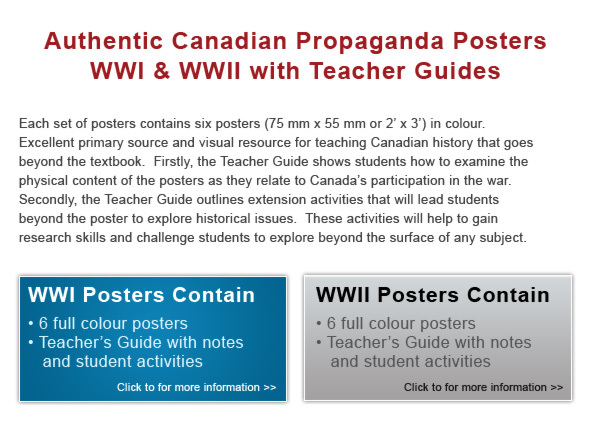 Wartime propaganda was often designed to produce in the viewer strong feelings of guilt. 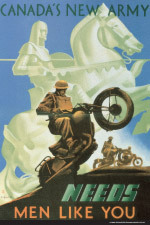 Typically, one’s countrymen would be depicted in a setting where he is battling against impossible odds. 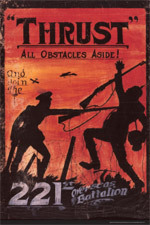 The aim of this poster is to inspire young men at home to enlist and help their struggling comrades. After Pearl Harbor and the fall of Hong Kong, Canada was in a global war. As in the First World War, men were called to arms. Women were called to support roles in the theatre of battle. By wars end, women had filled more than one quarter of the jobs in the aircraft industry and more than 250,000 women worked in the munitions industry. 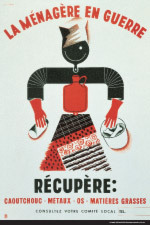 With this poster, the government is encouraging women to fulfill a bigger role in the war effort. In the summer of 1940, Britain stood along against the Nazi juggernaut. 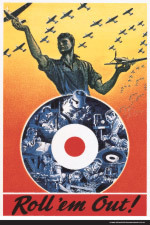 The courageous stand in the Battle of Britain, with the help of the RAF and the RCAF, saved the day. The Canadian aircraft industry manufactured the planes to keep the defence of Britain assured.. 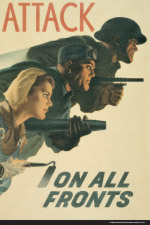 This poster reflects the effort and the demands of this very important aspect of the war. Another effective propaganda tool was historic symbols. 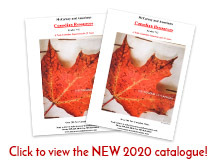 At the outset of World War 11, Canada was for all intents and purposes a Christian country. The symbol of the valiant knight would have a special meaning for a young Canadian many in the early twentieth century as every student would have been well versed in the British epic. The Canadian government realized that the Canadian workers were to be valued and encouraged to believe that their efforts on the factory floor were as important as those of the soldiers in the field. This poster reinforced within working men and women the importance and value of their labour. 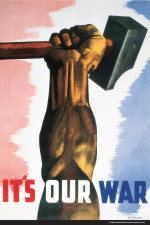 With the onset of modern warfare, all aspects of society became involved in the war effort. Now, spies and saboteurs were equally interested in destroying industry as they were in intercepting military secrets. 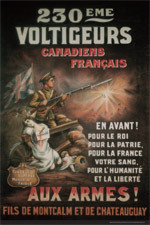 This poster reminded Canadians of the need to be vigilant regarding what they said and to whom they said it. To may of us, recycling may seem to be a modern phenomenon. History proves otherwise. 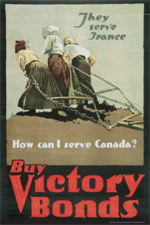 One of the challenges of the Canadian government was to ensure that sufficient resources were made available for the war effort. To accommodate this need, a recycling and rationing program were initiated and monitored by the government. This poster encourages Canadians to do their part.